In order to ensure timely handling of manuscripts, please read and follow these instructions carefully while preparing a manuscript and check the contribution for conformity with these notes before submitting it for peer review. Please submit your manuscript preferably via http://journals.sfu.ca/hthp/index.php/hthp/index, the journal’s homepage, or, alternatively, via e-mail to the editor at: hthp.editors@gmail.com. Please include complete postal addresses, e-mail addresses, and telephone and fax numbers for all authors of the article. HTHP also supports ORCID ID. Authors are encouraged to use this service. For details, see https://orcid.org/. The preferred order of presentation is: title, authors and affiliations, abstract, keywords, introduction, materials and methods, results, discussion, acknowledegments, references, tables, figure legends, and figures. Submission of a paper to High Temperatures–High Pressures implies that it has not been published or submitted elsewhere. Please attach all necessary permissions for any manuscript that includes copyright material, namely extended quotations, figures, tables, and results of government-sponsored research. Authors must follow strict ethical rules regarding co-authorship and plagiarism as defined in “guidelines for professional conduct” by the American Physical Society (http://www.aps.org/policy/statements/ 02_2.cfm). They are also responsible for obtaining written permission to reprint copyright material. Upon acceptance of your paper, the publisher acquires the copyright for unlimited worldwide distribution including electronic media. A list of forthcoming papers that have been peer-reviewed and accepted for publication in HTHP but have not yet been assigned to an issue and are awaiting final changes before going to press can be viewed here. After publication, online versions of published papers are accessible to subscribers of the journal. In addition, Old City Publishing offers an open access option to authors. See the OCP website for details (http://www.oldcitypublishing.com/wp-content/uploads/2016/06/ Reprint-Open-Access-Form-fillable.pdf). There are no page charges. The corresponding author receives a high-resolution PDF file of the paper. Make all submissions as word-processed documents compatible with Microsoft Word. The manuscript and references should be double spaced, presented in an easily readable, standard font and size (such as 10 or 12 point Times New Roman or Arial). Number all pages. All manuscripts must be submitted in English; US (Webster) or UK (Oxford) spelling may be used. The manuscript must be accompanied by a cover letter, containing the e-mail address, fax and phone number of the corresponding author. Also provide an abbreviated title of a maximum of 35 characters. Title: Type the title of the paper in bold; do not capitalize main words. In the title, clearly indicate the scope and findings of the paper and provide an accurate indication of the contents. Authors: Give the names of authors in full, in capitals and small capitals (e.g. FIRST NAME INITIAL(S) LAST NAME). Give the department, institution and address (including postal code and country) for each author on separate lines after the list of authors and cite them by superscript Arabic numerals. Indicate the author to whom correspondence should be directed by an asterisk(*); for the corresponding author, give the e-mail address as a footnote. Abstract: Include an abstract of 150–250 words summarizing the significant findings. Keywords: Supply 6 to 12 words or phrases to aid in indexing the article. Tables: Number tables consecutively and include a clear descriptive title.Give table footnotes a symbol as listed in the Footnotes section, proceeding by row rather than by column order. Indicate table positions in the text; display each table and title on a separate page, after the reference list. Units: Use SI units throughout, including the kelvin (K) for temperature. Nomenclature: A section on nomenclature is optional; if necessary, add it after the text and before the reference list. Tabulate the symbol, its meaning and its SI unit. Acknowledgements: Present information concerning grant support for research and assistance of colleagues in this section, not in footnotes. Iida T, Guthrie R. I. l. The thermophysical properties of metallic liquids. Oxford: University Press; 2015, http://dx.doi.org/10.1093/acprof:oso/9780198729839.001.0001. Suga, H., Pottlacher, G., Egry, I. 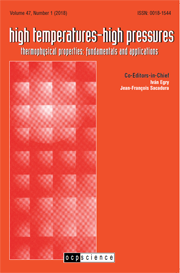 Extreme conditions, in: Measurement of the thermodynamic properties of single phases, Goodwin, A.R.H., Marsh, K.N., Wakeham, W.A. eds., Amsterdam: Elsevier; 2003, p. 475, http://dx.doi.org/10.1016/S1874-5644(03)80013-9. Mention of figures and tables within text: Refer to figures, tables within the text by their full names (e.g. “See Table 1”, “Figure 1 illustrates…”). Footnotes: Minimize the use of footnotesa. Footnotes should be indicated in the text by small letters (superscript) in alphabetical order. Do not use numerals for footnote call-outs, as they are used to indicate affiliations (see Authors section) and can be mistaken for bibliographical references or exponents. Type each footnote at the bottom of the page on which its text call-out appears. Footnotes to a table should be indicated by the same symbols. Reinitialize the symbol sequence for each table. Type footnotes to a table directly beneath the table. Figures should be provided as separate electronic files, preferably in PDF, EPS, TIFF or JPG format. Imperatively, provide all electronic images as high-resolution files. Save photographic images (monochrome or colour) at a minimum resolution of 300 dpi. Save line art at least with 600 dpi. Provide full captions, photo credits (if necessary) and permission statements (if necessary) for each photo and figure. label all images clearly, with the figure number in the file name. Top should be indicated if it is not immediately apparent. Indicate the position of each figure in the text. Display figures with their captions on separate pages at the end of the manuscript. Whenever the use of colour is critical for understanding a figure, the journal publishes the figure in colour without charge to authors. Reprints in colour will carry a surcharge. Details are provided on the reprint order form. aThis is version 1.4 of the instructions to authors, dated 2017-11-03. Ammeded 2018-2-13.